Helix Motor Drive from Wilderness Systems and Torqeedo! Just arrived in Australia – the new Helix Motor Drive is compatible with the Wilderness Systems fishing kayaks with the Flex Pod OS console, currently the ATAK 140, with new models coming out this summer! FACT: The state-of-the-art Helix MD Motor Drive is not a trolling motor. The Helix MD Motor Drive is the first motor drive to be designed specifically—from shaft, to prop, to gearing, to battery—to propel a kayak. And thanks to its unique lithium battery and optimum torque, the Helix MD is substantially more powerful, smaller and lighter than trolling motors. Trolling motors are designed to move heavy fishing boats very, very slowly —and have been somewhat adapted to fit on kayaks— however you still have to deal with that heavy and clunky battery. FACT: Torqeedo lithium batteries are safer, more efficient, more powerful and lighter than the alternative. They’re even buoyant! Torqeedo makes the safest lithium batteries on the market, with individually-welded safety cells and a state-of-the-art management system. Lithium batteries store significantly more energy than all other batteries so they weigh much less. The battery weighs 6 lbs. including casing, electronics and cells, compared to lead-acid/trolling batteries that can weigh between 40 and 90 lbs. FACT: The smart, integrated display on the throttle shows information on the status of the battery, GPS-based calculation of speed and your remaining range. It is important to pay attention to the feedback the throttle display is reading. Environmental conditions, boat design, and your carry capacity can all impact your motor’s achievable range. Monitoring your battery life and range will ensure that you have the optimal experience and can prevent you from overextending capabilities. 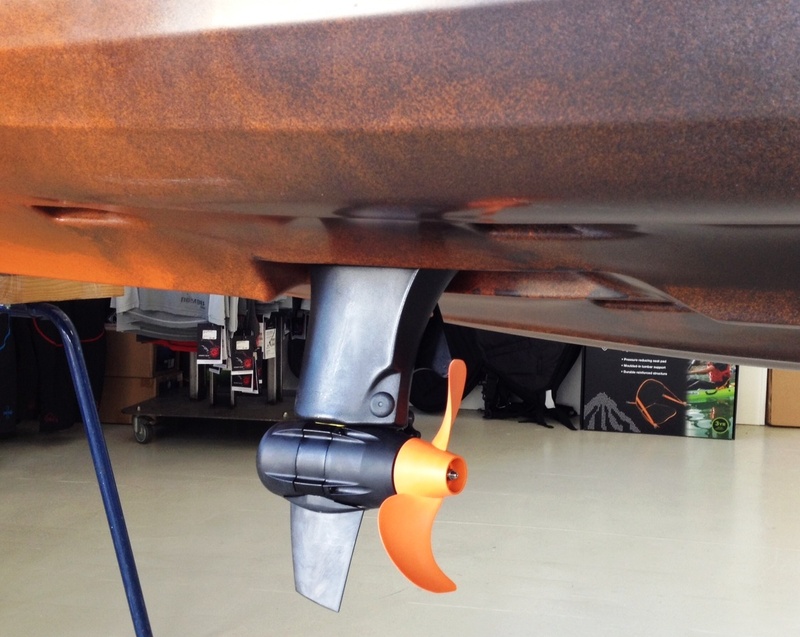 FACT: The Propeller Alignment System offers easy installation and removal. 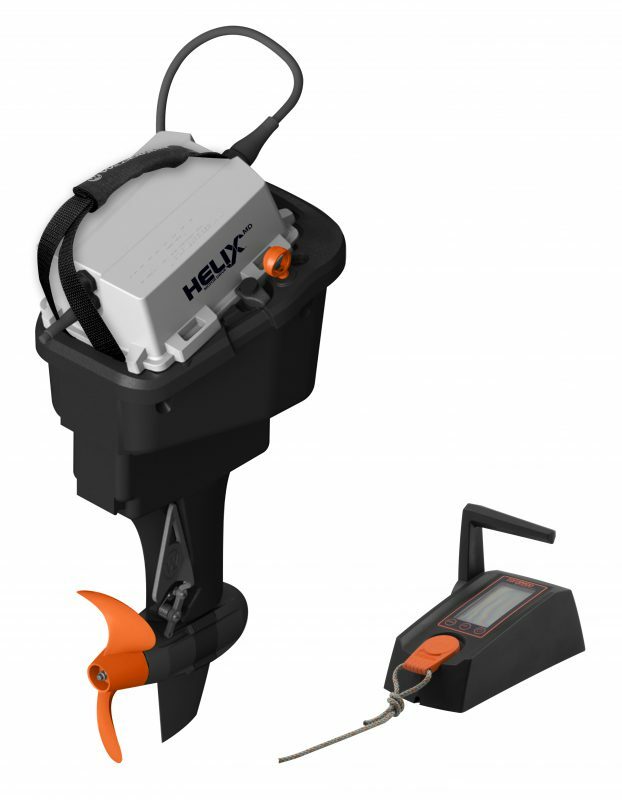 The Propeller Alignment System was designed to help you remove the Helix MD from the FlexPod OS scupper of the kayak. Come down to Paddlesports Megastore and check it out! Perception, a leader in recreational and touring kayaks for 40 years, recently announced the newest member of its renowned Pescador family of fishing kayaks. The Pescador Pilot is an affordable sit-on-top packed to the gills with fishing features and complete with the Pilot Drive pedal system. “The Pescador Pilot offers big performance at a small price. It allows anglers to get to their fishing spots quickly and multiplies the number of casts they can throw,” said Evan Lyendecker, marketing director for Perception. The optimised gear ratio in the Pilot Drive allows for effortless all-day cruising, while the custom-designed, patent-pending Turbo Flaps reduce noise and keep turbulence to a minimum under the kayak and inside the Pilot scupper. The intuitive Pilot Drive makes launching or docking easy—simply insert the Quick Key to engage or disengage—while the view into the Pilot scupper simplifies aligning the prop for zero draft transitioning. A recess in the hull stores the lightweight drive while not in use and the center scupper lid allows for easy transportation and storage. Forward and reverse motion paired with EasyGrip low-profile rudder steering control allows for a super tight turn radius, offering all-around maneuverability in those hard-to-reach places while eliminating line tangling. In addition to the drive system, the Pescador Pilot is full of features serious anglers seek including a stadium-style, comfort-focused Captain’s Chair with on-the-fly adjustability to fit a range of heights. Bow Storage Pods with a transducer scupper provide a secure space for gear and electronics. Pre-installed inserts for transducer mounting and precisely placed inlet/outlets for direct wiring to the transducer scupper and display makeelectronic install a breeze. For more info contact the team at Paddlesports Megastore!